Wrong. For a day of your time and £110, Mark Michie and his guys at XBOOST are ready and waiting to blow the doors off your smug preconceptions. Welcome to Trials Riding, Scottish stylee, which will leave you initially exasperated, absolutely exhilarated and utterly exhausted. And just maybe dreaming of being the next Dougie Lampkin. Mark tried trials riding in the mountains of France while on holiday, and was hooked, and when he realised there was nowhere similar in the UK, he opened a business this year to let us all try it. XBOOST is based midway between Glasgow and Edinburgh, in a location that boasts a view to die for. You can literally see from one side of Scotland to the other once you get to the top of the hill on your bike, its like standing on top of the world. Fabulous. But first you have to get there. Sessions start at 9:30 am with 6 punters and 2 instructors. 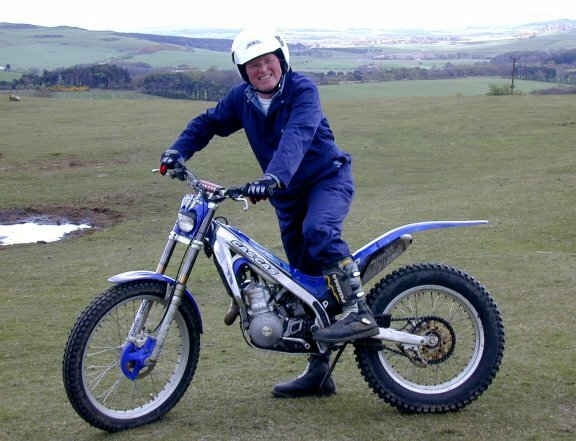 After a briefing from Mark, and a kit-up in boots, gloves, helmet and overalls (all provided), you are assessed on a trials bike in a field, to see if you make the grade. Hey no bother, just a few cones to go round, just like your old CBT yeh? Not quite, that old 125 that you passed you test on had a seat, these dont, you have to stand, and they have hair trigger controls, and weigh nothing. One false move and you are eating turf. The first half an hour is really tough, as you have to re-learn everything you thought you knew about bike control. But with seriously good tuition, you start to get the hang of leaning into turns and jumping logs, and before you know it, you are up on the hill, and romping across the moors. It is a truly liberating experience. This is where the day really comes together. You are taught how to climb slopes, jump rock faces, descend rubble pathways, in fact all the skills of a real trials rider. Dont confuse this with Motocross or Enduro either. This is not roostering about like a loon, but about developing skill, finesse, balance, throttle and brake control. As the day goes by you find yourself tackling ever more improbable stretches of terrain, using the traction of these astonishing little GasGas bikes to climb and turn like a pro. Well almost, but at least I did not fall off, honest! £110 may seem a lot, but you get a lot in return. Small group, brilliant tuition, lunch and coffees thrown in. Best of all, no sharing bikes, you have your own personal bike for the whole day, which means you get more saddle time than most folk have the stamina to handle. By 4:00pm I was absolutely shattered, but completely made up with myself. I confess that I had misgivings in the first session that I would never get the hang of it, but by the end of the day I was riding confidently over ridges and rocks that would have seemed impossible a few hours before. The small group size means that each person can progress at his or her own rate, and some of the better guys were really rocking by the end. During the course of the day, Mark even taught one young lady who had never even ridden a bike before to get out and up the hill. Damned impressive. Still think you know everything about biking? I came a away with a new found respect for those trials guys you see on the telly, but more importantly with a whole new set of riding skills, and that has to be worth £110 of anyones money. Check out XBOOST on www.xboost.co.uk, and ride to the top of Scotland. A top day out in Gods own country, what more could you ask.